Since it was founded on Aug. 26, 1935, the UAW has been a leader in the fight for progressive policies and programs that have given millions of Americans the opportunity to realize the American Dream. “Those who came before us fought hard and, in some cases, put their lives on the line to create a better world for us,” said UAW President Ron Gettelfinger. "The best way to honor them is to pave the way for those who will come after us." 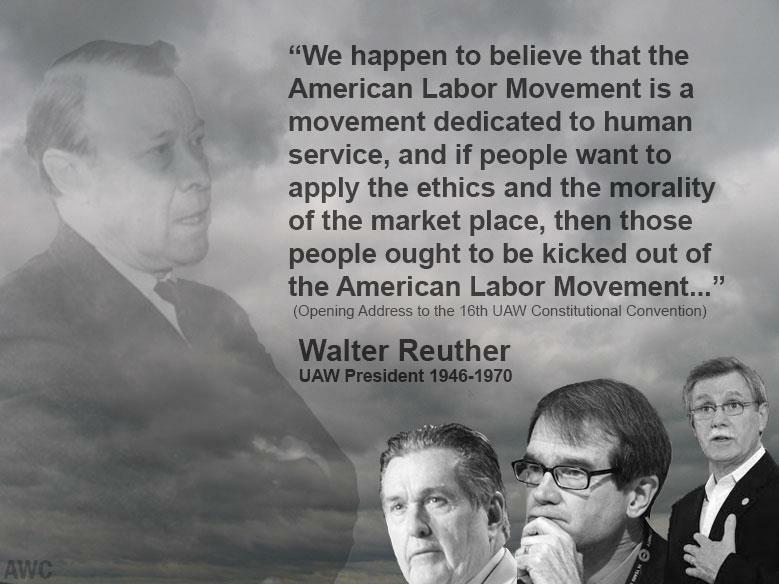 The early UAW leadership – including brothers Walter, Victor and Roy Reuther – organized workers to fight for more than another “nickel in the paycheck.” We fought for dignity and respect on the job. President Franklin D. Roosevelt signed the National Labor Relations Act in 1935, requiring employers to negotiate with duly elected unions. The UAW was moving full speed ahead. Using sit-down strikes, the union won gains for workers and eventually union recognition at Bendix Corp. in South Bend, Ind., and Kelsey-Hayes Wheel Co. in Detroit. Then workers courageously took on the world’s biggest and richest corporation: General Motors. The historic 44-day Flint sit-down strike established the UAW as the bargaining representative for tens of thousands of GM workers. Just weeks later Chrysler recognized the UAW after workers sat down at nine Detroit plants. Organizing workers at Ford Motor Co. proved tougher and bloodier. Organizers were brutally beaten by company thugs in the 1937 Battle of the Overpass. But the never-give-up force of solidarity triumphed in 1941 when workers struck Ford and won a union contract. That was just the beginning. Company after company ceded to workers’ demands and recognized the UAW as their representative. Months after Ford workers organized, the Japanese bombed Pearl Harbor and the United States entered World War II. All Americans faced a new danger and common enemies. As men joined the armed forces, the UAW was transformed by thousands of women who worked as Rosie the Riveters and joined the union’s ranks. After the war, the UAW continued to set bargaining standards for all workers. We were the first to negotiate health insurance for workers and their families, paid vacation time, cost-of-living increases, company-funded pensions, Supplemental Unemployment Benefits, 30-and-out retirement, a paid Election Day holiday and many more contractual landmarks. The UAW grew to represent workers in aerospace, agricultural implements and other sectors. The lake was formed by glaciers and covers about 10,100 acres, is three (3) miles wide and six (6) miles long, with a shoreline of 27 miles. It is called Black Lake because the depth of the water (up to 50 feet) and the tannic acid run-off of the forest that makes the water appear very black. The lake is home to walleye, perch, pike and sturgeon. The sandy bottomed beach known as “Hongore Bay” extends 200 yards into the lake. Most of the trees on the grounds consist of white, red, scotch and jack pines. Many of which were planted after World War I or by the Civilian Conservation Corps during the Great Depression. There are also cedar, oak, maple, aspen and hemlock. The Walter and May Reuther UAW Family Education Center is located on Black Lake near Onaway, Michigan near the tip of the Lower Peninsula. In August of 1966 the UAW International Executive Board Officers approved the purchase of Black Lake owned by the late Detroit Advertising Executive Lou Maxon. The only buildings that existed on the property were the log cabins Maxon had built. The main Maxon Lodge (Old Lodge) was built in 1932, using more than 15,000 tons of Crab Orchard Stone from Wisconsin and whole log construction that has hand-hewn beams and the stair treads are half log cuts as in the mantle over the fireplace. Many auto executives and celebrities stayed at the Maxon Lodge including Desi Arnas and Lucille Ball, who spent their honeymoon there (it is believed to have been room 222). The Inn (Mazy’s) was originally a horse stable. In January of 1967 the purchase was completed which included the Maxon Lodge along with 750 acres; with an option taken out to purchase an additional 250 acres in 1989 from the Sugar Estate, which adjoins the Hilltop area. Today, the UAW owns approximately 1,020 acres. Construction of the main buildings began in November 1967 and took nearly three (3) years to complete. Longtime friend of Walter Reuther and renowned architect Oskar Stonorov was the principle architect of the buildings.Wood used in and outside of the buildings; Douglas fir, the handrails on the staircases in the dining room are made of teak, the doors and wood trim are birch, the student corridor railings are red birch, and the wood paneling in the sleeping rooms is pecan. The fireplace hearths are from Canada and French Creek, Pennsylvania. Everything that looks like marble is actually granite and the bronze work was cast in Italy designed by Vivalli. The Center is made up of several buildings that are connected with intricate glass hallways so you never have to step outside. The roofs were constructed strong enough to carry five (5) feet of snow. The gymnasium/auditorium was the first building built; it can seat 1,200 and houses two full-sized basketball courts and an exercise/weight room. A bronze roof was placed on the gym, with brown, Italian-made gargoyles hovering over the roof. Adjacent to the gym is a, 150,000 gallon solar heated, Olympic-size indoor swimming pool with floor-to cathedral ceiling glass walls. The saunas are located in the dressing rooms. The massive columns came from Portland, Oregon and vary in diameter from nine (9) to sixteen (16) inches and some are forty (40) feet long. They were turned in Washington State on lathes that were once used to turn the masts of wooden sail ships. The longest beam is a Douglas fir and is 72 feet long; it is located in the buffet style dining room that has a seat capacity of up to 400 guests. The bronze fireplace in the Dining Room has a Latin inscription that is the motto of Michigan; “If you seek a pleasant peninsula, look about you.” The lecture hall adjoining the dining area can accommodate groups as large as 320 people. A recreation center is located beneath the lecture hall and is equipped with pool and tennis tables. The 300 pound black stone outside the Dining Room is lava stone and was a gift to the Center from the quarry in Wisconsin. In the Main Lobby hangs a 20-foot mural called “And The Truth Goes Marching On.” The painting was commissioned by Region 5 and donated to the Center. Painted by Don Cincone, the mural provides a historical pictorial of labor leaders including nine (9) UAW presidents. Also in the Main Lobby is a pictorial history of Walter and May Reuther. The bronze sculpture at the fork of the road to the Main Lobby is called “Children of the World”. The Japanese arch bridge is pre-cast cement and its bronze sculptured light is called Man and Woman. The Hub or Zodiac Room has bronze and Venetian glass plaques that displays the position of the stars on the birthdate of Walter Reuther—September 1, 1907. This was a gift to the center from the Construction trades who built the Center. Black Lake has a selection of rooms, condominiums, apartments and private chalets such as the Round House, the Woodcock House and the Guest House. The Main Hotel accommodates 400 sleeping rooms. The Hilltop/Upper Lodge, used for small conferences, has six (6) chalets. There is also a classroom that seats seventy-two (72) people. There are 228 sleeping rooms available, with the capacity to house 395 people depending on rooming accommodations at the “Hilltop Chalets”. There is also a fifty-one (51) site campground for the use of UAW members fully equipped with full hook-up of water, sewer and electricity. The Black Lake Golf Club, 18-hole golf course, was completed in September of 1999 and opened in June 2000 and is the newest addition to the Family Education Center. Designed by acclaimed architect Rees Jones, the course is situated on 1,000 acres of heavily-forested land on the southeast side of one of Michigan's largest inland lakes. It also includes a par 3 pitch-and-putt. . The course was both built and is fully operated by union workers.Inside the Club House is a dining restaurant and a gift shop. Most of the Center’s pipes, power lines and city utility system are buried underground. The blender treatment plant covers six (6) acres including five (5), 1-acre lagoons which pump all waste water away from the lake, virtually eliminating pollution. “There is no greater calling than to serve your brother; There is no greater satisfaction than to have done it well.” Walter P. Reuther and May Reuther In Brotherhood and Peace.